What makes the Rwandan genocide of just a quarter of a century ago so disturbing is how intimate it was. There is a brumal callousness in the Nazi gas chambers, a genocide of Jewish innocents that mirrored the mechanisms of industry. But Rwanda was up close and personal, enacted with nothing more than machetes, knives and hatchets, in which the slayer and the slain had sight of each others eyes and could simultaneously smell the fear of death and the fetid irrationality of murderous hate. Her eyes have haunted me for quarter of a century. She was tall and beautiful, in her mid 20s, with long flowing black hair, knotted with braids that reminded me of my Celtic roots. She never smiled. Nor did she make eye contact during the two days that I existed in her presence somewhere in Kigali, the capital of Rwanda. Her eyes seemed empty, as if she was a hollowed vacuum behind the outer casing of her body. Not unlike a humanoid robot that appears to have everything but a soul. She was cold and distant and one might imagine she was aloof but for the brutal reality into which I had just arrived. It was only a few weeks after the Hutu majority had fled Rwanda to neighbouring Zaire, having exacted one of the most barbarous culling of fellow human beings since Nazi Germany half a century before; or the genocide enacted under Leopold II in the Belgian Free State at the end of the 19th and beginning of the 20th Centuries. Two month before, I travelled to Pretoria for the inauguration of President Nelson Mandela, on May 10, 1994. During a telephone call home my seven-year-old daughter, Therese, knowing that I was in Africa, fearfully asked, ‘Did you fly over Rwanda, Daddy?’ It was a shocking question, that one so young would be aware of what was happening somewhere on the continent I was visiting. “There are no Devils left in Hell,” the missionary said, “They are all in Rwanda”. When a couple of months later I encountered the beautiful young woman in Kigali I wondered what devils she had met. The apparent emptiness in her eyes was, in fact, the expression of a traumatized human being barely able to exist and who, very likely, wasn’t even aware of my presence. What appeared to me as a hollow shell was nothing less than a young woman who was numbed by an encounter with dehumanised forces that murdered, maimed and violated her loved ones, and herself. 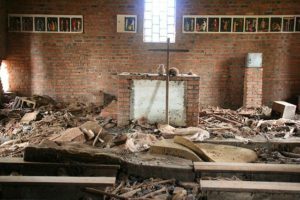 Over 100 days Hutu neighbours murdered over 800,000 Tutsi neighbours – women, babies (born and unborn), children and men – on average 8,000 per day. Amongst these were some moderate Hutu journalists and politicians, considered traitors. The UN has estimated that some quarter of a million women and girls were raped by Hutu militias and very likely that statistic includes the young woman I encountered. While UN, French and Belgian forces were present in Rwanda at the time, none intervened. The US were reluctant because of US Marine losses suffered in Somalia the previous year. Effectively, the world stood by until the Tutsi Rwandan Patriotic Front (RPF), supported by the Ugandan army, invaded from neighbouring Uganda, causing a mass exodus of Hutus fearing revenge for what they had done. Over two million Hutus fled to neighbouring countries, including Zaire. By the time the genocide had ended up to 70 percent of the entire Tutsi population had been slaughtered. But lest some might dismiss the Rwandan genocide as an entirely African barbarity let us not forget the role of the European colonization of Africa, especially Belgian colonialism, including elements of the Catholic Church, who favoured the Tutsi minority over the Hutu majority, thus allowing acquired privilege and diminished status to fester discontent across generations. Given that, to this day, equestrian statues of Leopold II populate towns and cities across Belgium, including the capital of the European Union, it suggests Europe has learned little from the divisions its conquering nations bequeathed to Africa. It is unthinkable that a statue to Adolf Hitler would be acceptable in any public space in the world today. Why then are statues of Leopold II acceptable in Belgium, particularly Brussels, given its privileged EU status? Is it because African people are considered of less importance to Jewish people? Let us pray for the people of Rwanda who are living with the memory of atrocities inflicted and atrocities endured. Let us pray for the generations born in the wake of the genocide and for generations to come that, irrespective of ethnicity, they will grow to understand that our common humanity is what makes us all children of God, each endowed with inalienable rights. May this understanding be the living memorial to all those whose lives were ended so cruelly. And let us pray for the descendants of colonial European powers who over four centuries altered the face of the earth, especially in Africa. Powers that created divisions through divisive favoritism, imposed boundaries – including partition – which are still the source of discontent today. May those descendants recognize that our acquired wealth and power has come at a heavy and disproportionate cost. And may they recognize that as we face an uncertain future, overshadowed by the impact of Climate Breakdown, we have no option but to willingly build a renewed Earth, based on fairness and justice, in which the vulnerable are valued in a new dispensation that begs sustainability. On August 1st 1994 Time Magazine led with another gruesome cover photo and headline. It depicted a carpet of trampled corpses of Hutu refugees stampeded to death at the border between Rwanda and the crossing to Goma, Zaire (now the Democratic Republic of Congo). The headline read: “This is the beginning of the final days. This is the apocalypse,” spoken by a resident of Goma. Each of us is responsible for the destiny of humanity by our actions or omissions.